A regiment of the Second Cavalry takes a short reconnaissance ride from Fort Ellis, Montana. The soldiers have stopped to rest the horses and themselves before moving on to complete the last of many such rides before the onset of winter. As a rule, most people view things from left to right. It's a habit from reading. 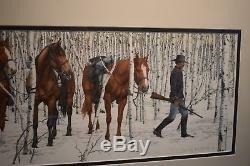 So, by camouflaging the two Blackfeet Indians, the viewer will pass over the I. Ndians on the extreme left of the painting, continue on down the row of horses to the soldier walking off the extreme right end of the painting. By having most of the horses turned and looking off to the right helps to subtly force the viewer's eye to the right and away from the "discovery" of the Indians. Discovering the Indians last rather than first helps to make the story more believable and lots more fun. 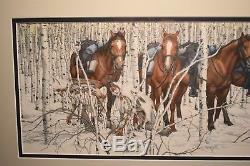 These Blackfeet Indians are about to be two horses richer, hence the title, Two Indian Horses. 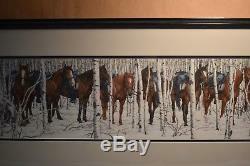 Beautiful signed and numbered lithograph by Bev Doolittle, framed and matted. Ready to go on your wall!! Limited Edition #10060 out of 12253. Measures 53.5" long; 14.75" tall; 1 deep. 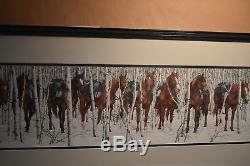 The item "Two Indian Horses Bev Doolittle Signed, Limited Edition! Framed Lithograph" is in sale since Monday, September 4, 2017. This item is in the category "Art\Art Prints". The seller is "pelc-services" and is located in Mesquite, Nevada. This item can be shipped to United States.